Camille Pissarro, some of the "Boulevarde Montmartre" series of 1897. We are all familiar with Monet’s famous series paintings of Grainstacks at Giverny and Rouen Cathedral. But these are by no means unique in Impressionist painting: others painted series, some of them larger and far more complex than any that Monet attempted. This series (!) of articles investigates series painting, and the Impressionists who painted series. Although there is a little literature on the subject, I have not (yet) come across a similar study, so many of my thoughts are original, and hopefully will cast new light on this fascinating subject. Prior to 1869, I am not aware of any artist who painted series of landscapes. Many had recurrent themes in their paintings, and many returned to paint the same motif on more than one occasion. It was common for painters to produce several studies, perhaps sketched plein air, in the course of preparing for a major studio work, but those were not intended to be a series of paintings of the same motif for the purpose of representing it in series. By the 1890s, three Impressionists had painted substantial series: Monet, Pissarro, and Sisley. Looking through their work, this did not happen out of the blue, nor did two copy the idea from the third (as has been suggested). Prior to their first formal series, each had painted very similar views of the same motif on more than one occasion, and sometimes painted two or three almost identical views of the same motif. However these had changed from being short informal series, which might just have ‘happened’ that way, into formal exercises in which the painter deliberately returned to the same viewpoint and painted the same motif under a range of different weather conditions, at different times of day, and under different lighting conditions. 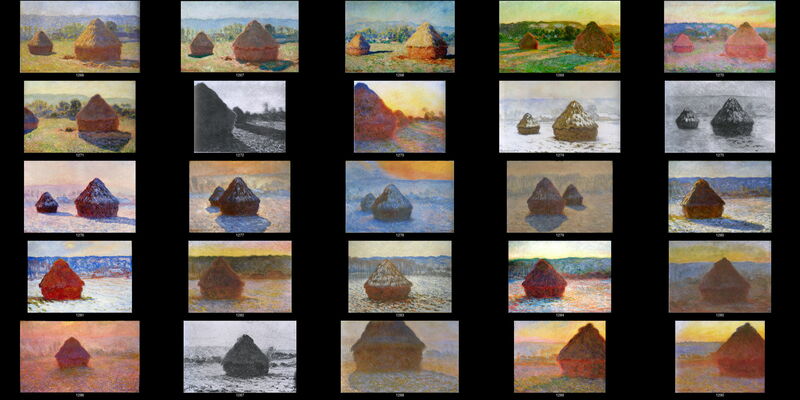 Perhaps the best example remains Monet’s Grainstacks series of 1890-1. I have already written here about the background to that series. Here is a complete collection of the 25 paintings accepted by Daniel Wildenstein’s four-volume catalogue raisoné (Taschen and the Wildenstein Institute, 1996) as constituting that series. This is probably the first time that you have seen them all together, and you will almost certainly never see the actual paintings together in the same location (nor have all 25 ever been seen in a single exhibition, I am afraid). Although for the moment these may seem a little arbitrary, I hope as I work through the different series you will see my reasoning. Some series are looser than others, in terms of the timescale over which they were painted, the precise view depicted, and so on; I will when appropriate distinguish those as loose series. Some series consist of more than one motif; I will when appropriate distinguish those as branched series, as the overall series contains different branches. If Monet was not the originator of series paintings, we need to look at the appearance of the first series works by Pissarro and Sisley. Although some might claim that Cézanne’s many paintings of Mont Sainte-Victoire constitute a series, I think that they represent a recurrent, perhaps obsessive, theme rather than a series according to the above criteria, just as his Bathers and still lifes were also recurrent themes. A more detailed study is needed to see whether they might form a loose branched series, in my terminology. Working through Wildenstein’s catalogue raisoné, the earliest series that I can find in Monet’s work is that of the Manneporte at Étretat, in 1885-6. This is still loose, and his first tight series is probably that of the Valley of the Creuse of 1889. Although Wildenstein is reluctant to consider that Monet undertook proper series painting prior to the Grainstacks of 1890-1, I will show in a later article that the Valley of the Creuse series is just as much a series as the later Grainstacks. Although Pissarro did not attempt proper series until 1892, when working at Bazincourt, he built a loose series of the road to Louveciennes in 1869-72. His series became tighter and then branching in the 1890s, in both Paris and Rouen. Sisley followed a similar course, with a loose series around Saint-Mammès in 1884-5, and a much tighter series, for which he is best known, of the Church at Moret-sur-Loing in 1893-4. If these are correct, then it appears that none of the three started series paintings first. Each moved gradually into loose series initially. However the conscious decision to paint tight series seems to have been made first by Monet in 1889, following which both Pissarro and Sisley decided to paint their own tight series. No doubt a major influence on them was the huge commercial success of Monet’s Grainstacks and Rouen Cathedral series. In the next articles in this series, I will consider each of the three series painters in turn, examining the evidence in their series paintings to understand what they aimed to do in them. Posted in Painting and tagged Cézanne, Impressionism, landscape, Monet, Pissarro, series, Sisley. Bookmark the permalink.